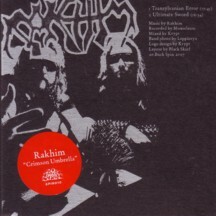 Rakhim is a duo known from Circle and Pharaoh Overlord who before this two-track CD have released a one-sided vinyl with gloomy, improvisational and experimental lo-fi madness. This CD has been labelled somewhere as black metal, but I wouldn’t go that far. In spite of the title, the disc doesn’t contain a cover version of the Jesters of Destiny track with the same title. It has two long, dark and improvisational works instead, played with drums, guitar and bass. The music also features growling, scary human voice. There are plenty of effects in there, and it’s hard to identify any guitar or bass from behind all the swelling, scrappy mass of sound. ”Transylvanian Error” starts with a coincidental sounding clatter, little bit of raspy voice and distortion feedback. This very experimental track gets more intense soon, but it never achieves any clear rhythm or anything. The atmosphere is very scary: now I know how it feels to be on a bad acid trip in hell. Then the track cools down a bit, but the delayed screaming brings in a really psychedelic feel. “Ultimate Sword” is at first strange effect terrain, insane delays and minimal banging. This is a very sinister, oppressive and psychedelic number that grows before the six-minute-marker but cools down later on. Crimson Umbrella offers a rather confusing, fuzzy and hazy half an hour of music that might well have been used by Celtic Frost, Venom or Bathory as an intro. It takes some time to really get into it, and although being in it and moving inside of it feels very unsafe, I still really enjoy the ride.